Who in your organisation sets your ‘Thank you’ standard? Do you view speed as an important factor in the ‘process’ of thanks? Is it someone’s job to offer a timely and meaningful ‘Thank you’ to all colleagues? Have you ever considered appointing a Chief Thank You Officer? While the latter can raise a laugh in some quarters, contemporary business practice is awake to the benefits of weaving the ability to deliver a sincere and timely ‘Thank you’ into its operational fabric. These two significant words benefit from being spoken frequently and with meaning to customers, to customer-facing staff and to all of the back-office workforce. But how is a timely ‘Thank you’ delivered – particularly to your workforce, when so many organisations are large, dispersed and very busy? The corollary? They become disengaged. In this scenario the best you can hope for is that they leave your organisation quickly, reducing any negative effect they have on other colleagues. If they leave, you are now looking for a new colleague – with all the associated time, financial costs, onboarding processes, training etc. This is where social recognition can be of great support. By using social recognition an organisation can encourage the delivery of timely, targeted thanks to all employees – given by all employees. In addition, as social recognition platforms are closely related to social media platforms interfaces are familiar and intuitive, reducing the need for formal training, and increasing their impact from the moment they are implemented. While social recognition will not prevent employees from leaving, it can support those whose desire to leave was rooted in a lack of recognition. Social recognition can also help in the retention of staff, especially Millennials. We are continually hearing that Millennials are fast becoming the majority age group within the workforce. According to a study carried out by Price Waterhouse Cooper (PwC), 38% of Millennials do not expect to remain in a post for more than nine years. In fact, according to Jeanne Meister, most Millennials remain in an organisation for less than three years. ‘The Millennial Generation has learned to be two things during the recession: resilient and nomadic. As the job market improves, the level of confidence will improve along with it and cause many in this age group to re-evaluate their current situation, possibly seeing value in seeking greener pastures’ (Rich Milgram). During their time with an organisation, Millennials expect to receive recognition. They understand that recognition is as important as their formal terms and conditions. For Millennials, traditional recognition solutions do not fully answer their needs – and they don’t want to wait! Not receiving recognition will push them to consider moving on sooner rather than later. This is where thanks offered via a social recognition solution scores highly. It fulfils their need for speedy, targeted recognition and it is delivered digitally. The latter should not go unappreciated as Millennials are already deeply socially wired to friends and family via the likes of Snapchat, Instagram and Facebook. If you or your organisation considers the appointment of a Chief Thank You, Officer, a step too far, a more reasonable step is to consider the addition of a social recognition platform to the payroll in 2016. It can offer the ability to recognise individuals and teams for their good work in a timely manner. Social Recognition solutions also support the retention of talent across the age groups – as it isn’t just Millennials who like to be thanked personally and immediately. 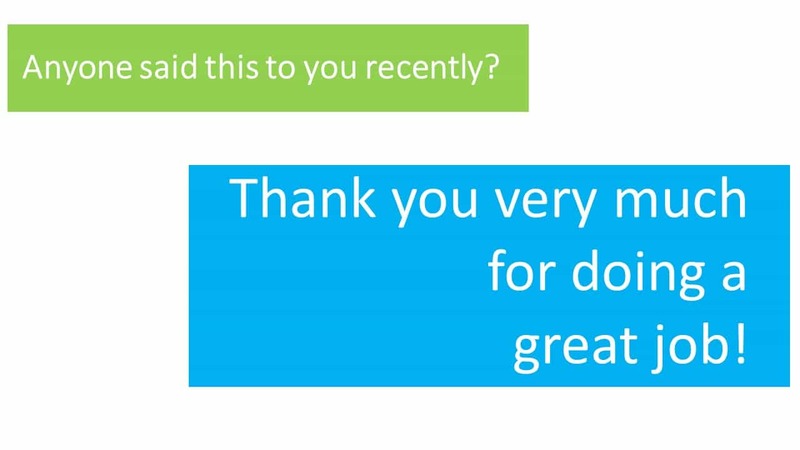 Your choice of social recognition platform – for example, Kudos Social Recognition, provides an ‘always on’ solution, encouraging all member of the workforce to say a meaningful and timely ‘Thank You’ – for a job well done.